This Kathy Van Zeeland handbag doesn't cost a billion bucks, and it won't really make you look a billion bucks either. But this surprisingly conservative handbag from Kathy Van Zeeland is one of the designer's better purses. With all those buckled tabs and rows of studs, we can't really call the design minimalist. But when compared with the flamboyant designs Kathy Van Zeeland typically produces, this one's pretty sedate. The color palette is subdued, and there's only one hue on each purse. For KVZ, that's downright tame. While the exterior is more basic than we'd expect, no effort has been spared inside. There's a zippered central compartment to make the generous space more user friendly, and zip and slip pockets for holding gadgets and other small valuables. This purse could be the one Kathy Van Zeeland fans look to when they need to play it safe, or the shopper that wins over her naysayers. Either way at $99 I think Kathy Van Zeeland has done enough to make us all happy! 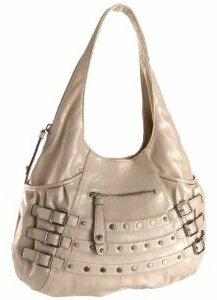 The Kathy Van Zeeland Billion Bucks satchel bag, a great alternative to this shopper bag.